Papyrus Presents: Richard Branson! | Papyrus Watch - Exposing the overuse of the Papyrus font. "You've gotta be kidding me...Do you have any idea who I am? I know that's Papyrus. You think I'm stupid? I subscribe to papyruswatch.com". Seriously. I caught this on the Discovery Channel the other night at a friends house on our way out the door. Apparently it's form Season 4, Episode 15 of Mind Freak, called Billionaire Prediction. From what I can tell it was just Discovery Channel that aired it with the Papyrus. 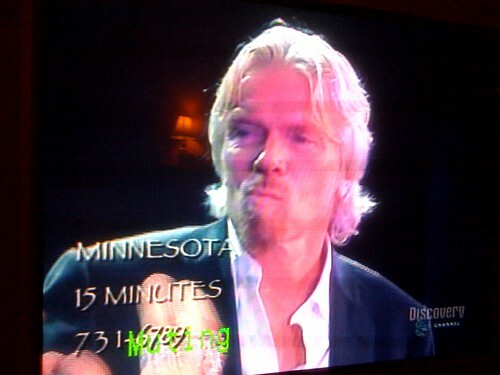 C'mon Discovery...this guy's a billionaire-super-space-tourism-knight who ascends into crowds on a zip wire. Just look at the guy, he knows, he sees the Papyrus. When searching for info on this show I discovered this isn't the first time Branson and Angel have appeared together. In 2007 they did a launch for "post-paid" contracts for Virgin Mobile in Canada, and again to kick off the Virgin Unite charity here in Canada.